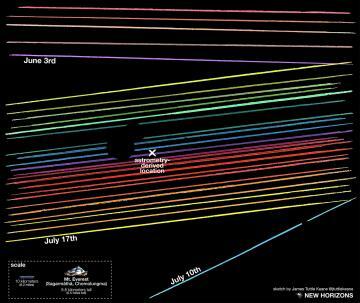 December 11, 2017Does New Horizons' Next Target Have a Moon? 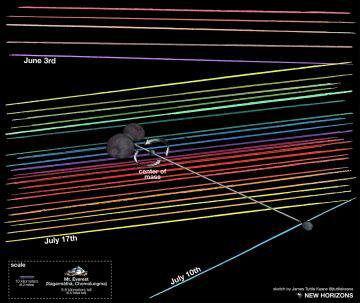 The data that led to these hints at MU69's nature were gathered over six weeks in June and July, when the team made three attempts to place telescopes in the narrow shadow of MU69 as it passed in front of a star. The most valuable recon came on July 17, when five telescopes deployed by the New Horizons team in Argentina were in the right place at the right time to catch this fleeting shadow — an event known as an occultation – and capture important data on MU69's size, shape and orbit. That data raised the possibility that MU69 might be two like-sized objects, or what's known as a binary. The prospect that MU69 might have a moon arose from data collected during a different occultation on July 10, by NASA's airborne Stratospheric Observatory for Infrared Astronomy (SOFIA). Focused on MU69's expected location while flying over the Pacific Ocean, SOFIA detected what appeared to be a very short drop-out in the star's light. Buie said further analysis of that data, including syncing it with MU69 orbit calculations provided by the European Space Agency's Gaia mission, opens the possibility that the "blip" SOFIA detected could be another object around MU69. "A binary with a smaller moon might also help explain the shifts we see in the position of MU69 during these various occultations," Buie added. "It's all very suggestive, but another step in our work to get a clear picture of MU69 before New Horizons flies by, just over a year from now." "The occultation effort that Marc Buie and his team led for New Horizons has been invaluable in opening our eyes to the very real possibilities that MU69 is both a lot more complex than anyone suspected, and that it holds many surprises for us at flyby on New Year's Eve and New Year's Day, 2019," added New Horizons Principal Investigator Alan Stern, also from Southwest Research Institute. "The allure of its exploration is becoming stronger and stronger as we learn more and more about it. It's just fantastic!"